Dramatic events and agreement between two outstanding historical personalities led to the construction of one of the most beautiful buildings in this part of Europe – Voronet Monastery (Voroneț Monastery) with its gorgeous Saint George Church. 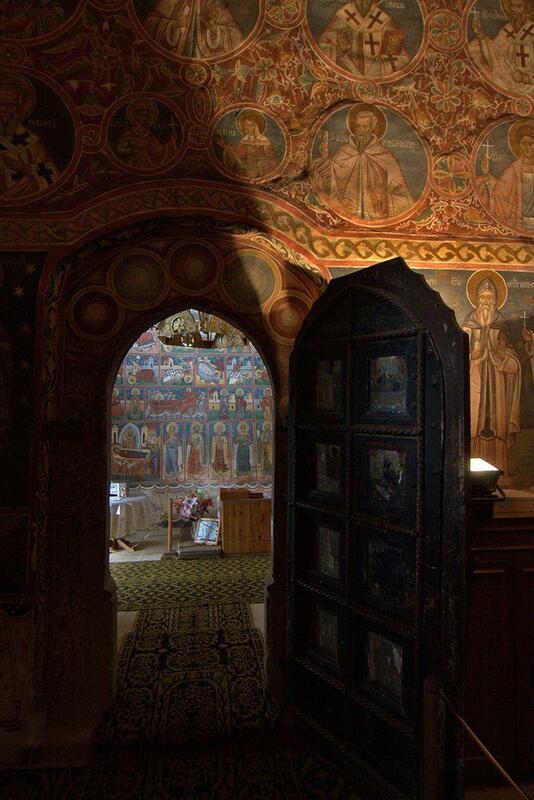 Thanks to the frescoes on the outer walls of the church it is nicknamed by some: "Sixtine Chapel of the East". Late 15th century was dangerous time for the Principality of Moldavia – it was surrounded by powerful and hostile neighbors – Ottomans, Poland, Hungary. Only strong leadership could save the state from the elimination and Moldavia had such leader – Stephen the Great. Especially desperate was the resistance of Moldavians against the enormous Ottoman Empire – Moldavians were great warriors but army of Ottomans was larger. In 1476 there took place the terrible Battle of Valea Albă which ended with a victory of Ottomans but nevertheless weakened them and prevented the takeover of Moldavia. Stephen the Great and his state thus gained some time for recovery and contemplations about the further resistance. In the forest of southern Bukovina lived a well known hermit – Saint Daniil the Hermit. 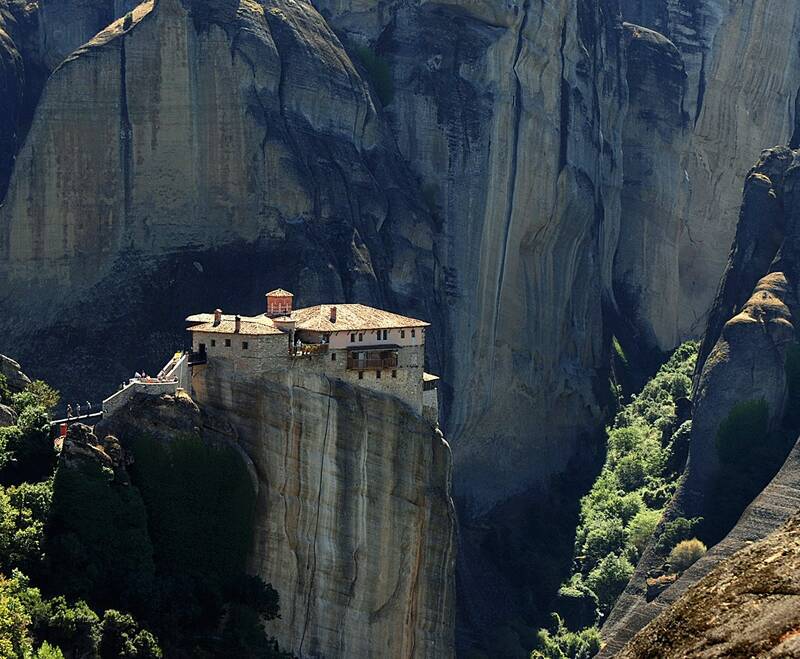 This holy man built an unusual hermitage in the rocks and was well knowns thanks to his wisdom. In fact the deeds of this man inspired many other people and there appeared more hermits in this locality and quite a few monasteries were founded by them soon after. Stephen the Great decided to meet Saint Daniil and to discuss – what should be done next? Should Moldavians stop the bloody resistance against Ottomans and submit to them? Or should they continue to fight? Saint Daniil gave a convincing answer – Moldavia should not surrender and needs to fight! 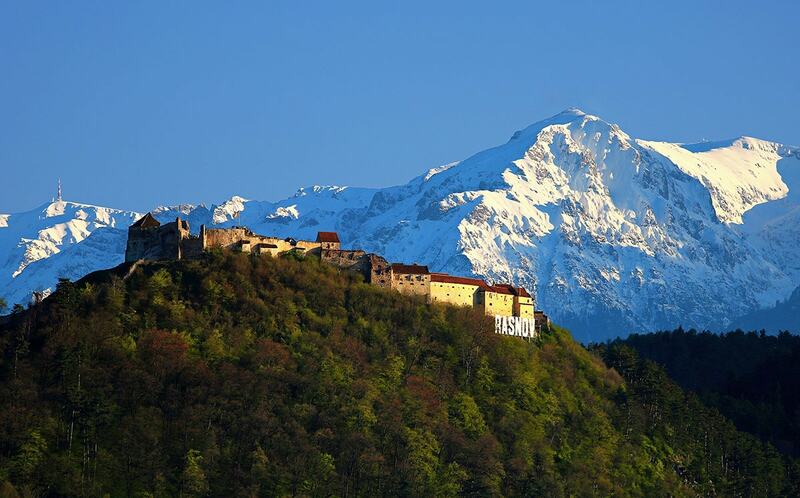 Both great men agreed that in the case of success Stephen the Great would build a monastery dedicated to Saint George. As the period of relative stability in Moldavia continued and state recovered, Stephen the Great was grateful to God and and his servant – the hermit. So he kept his word and there was built a great monastery – Voronet Monastery with its beautiful church. Judging from the commemorative inscription above the entrance it was built in less than four months time – from the 26th May 1488 to 14th September. Saint Daniil was asked to lead the new monastery and he moved here from his hermitage and lived here up to his death in 1496. He is buried in the church. Admirable changes took place here in the 16th century: in 1547, in the times of bishop Grigorie Roșca the church was extended and turned into unusual open-air exhibition: the outside of the church was covered with beautiful frescoes depicting the most important parts of Bible. Thus the church helped to "read" Bible even to those local people who could not read. Voroneț monastery served as a centre of knowledge and its monks excelled in the art of calligraphy and translation of religious texts. Monastery was abandoned after 1775 when this part of Moldavia was annexed by the Habsburg Monarchy. 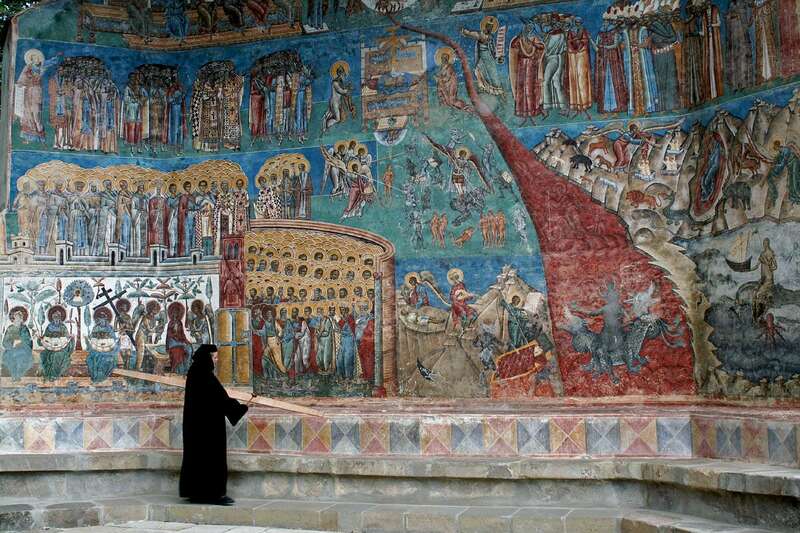 Only in 1991 the activity of monastery was restarted: now this is women’s monastery. Buildings of the monastery have been designed in the unique Moldavian style – structurally and in details the buildings have many features characteristic for the contemporary Gothic and Renaissance style but the whole appearance of the church resembles much earlier style – Byzantine. For example, arches of the windows are shaped in the Flamboyant Gothic style. 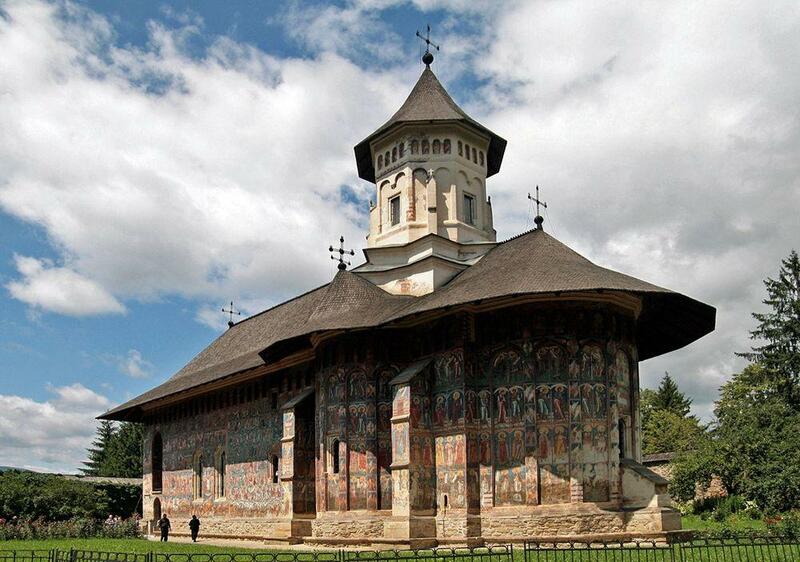 Monastery and its church is one of the eight Moldavian churches included in the UNESCO World Heritage monument "Churches of Moldavia". Outer walls (as well as the interior) of all these churches are covered with masterpieces of painting which have been inspired by the Byzantine art. The concept of churches (and – in fact – any kind of buildings) which are completely covered with murals from the outside, is rare in the world. 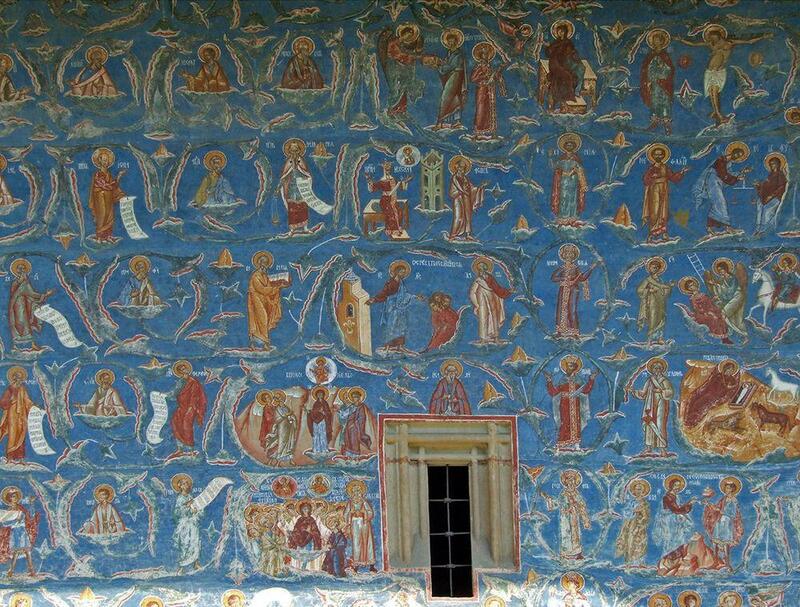 Especially large "canvas" in Voronet Monastery is the western facade of the church which has no windows – it was built during the extension in 1547 with a purpose to be covered with murals. Paintings show religious figures but at the same time this is genuinely local art depicting Moldavian people with Moldavian musical instruments and garments. Most beautiful is the painting of the Last Judgement on the western wall of the church – it is great work of art with much humanism and even irony targeting the human nature. Paintings have very bright colors, especially the bright blue background. This intense blue color has its own name – "Voroneţ Blue". This large country has very diverse landscape and has been a cradle for several prehistoric and ancient cultures. People in Romania have created distinct styles of architecture and built many amazing structures. Most impressive and unusual landmarks here are historical cities and towns, the gorgeous "painted" monasteries and great castles. 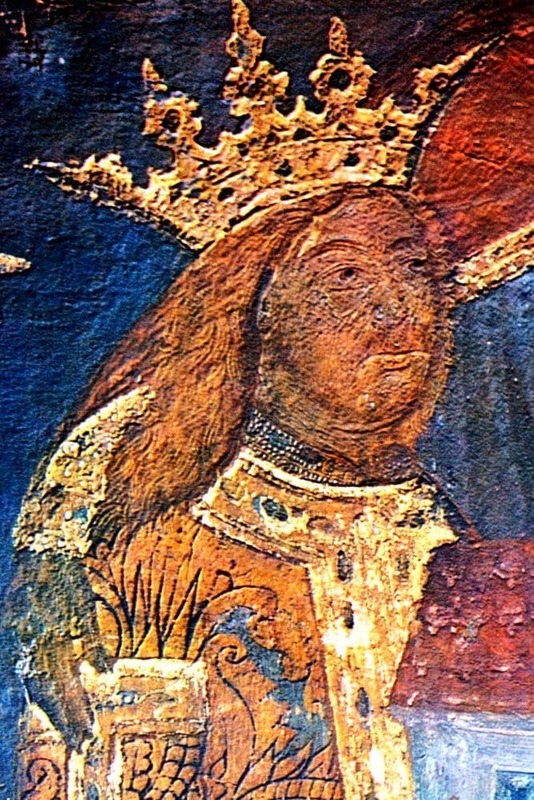 Moldavian Murals from the 15th to the 16th Century.